Connections • The cards are equipped with SMA connectors for the Software Support analog signals as well as for the two external trigger inputs, and clock input and output. In addition, there Windows drivers are three MMCX connectors that are used for the The cards are delivered with drivers for Windows 7, Windows 8 three multi-function I/O connectors. These multi-func- and Windows 10 (32 bit and 64 bit). Programming examples for tion connectors can be individually programmed to Visual C++, C++ Builder, LabWindows/CVI, Delphi, Visual Basic, perform different functions: VB.NET, C#, J#, Python, Java and IVI are included. • Trigger output • Status output (armed, triggered, ready, ...) Linux Drivers • Synchronous digital inputs, being stored inside the analog data All cards are delivered with full Linux support. Pre com- samples piled kernel modules are included for the most common • Asynchronous I/O lines distributions like Fedora, Suse, Ubuntu LTS or Debian. The Linux support includes SMP systems, 32 bit and 64 bit Input Amplifier systems, versatile programming examples for GNU C++, The analog inputs can be adapt- Python as well as the possibility to get the driver sources for your ed to real world signals using a own compilation. wide variety of settings that are individual for each channel. By SBench 6 using software commands the in- put termination can be changed A base license of SBench 6, the between 50 Ohm and 1 MOhm, one can select a matching input easy-to-use graphical operating range and the signal offset can be compensated by programmable software for Spectrum cards, is in- AC coupling. The latest hardware revisions additionally allow for cluded in the delivery. The base li- offset compensation for DC-coupled inputs as well. cense makes it is possible to test the card, display acquired data and make some basic measure- Software selectable input path ments. It's a valuable tool for For each of the analog channels the user has the choice between checking the card’s performance two analog input paths. The „Buffered“ path offers the highest flex- and assisting with the unit’s initial ibility when it comes to input ranges and termination. A software setup. The cards also come with a demo license for the SBench 6 programmable 50 Ohm and 1 MOhm termination also allows to professional version. This license gives the user the opportunity to connect standard oscilloscope probes to the card. The „50 Ohm“ test the additional features of the professional version with their path on the other hand provides the highest bandwidth and the best hardware. The professional version contains several advanced signal integrity with a fewer number of input ranges and a fixed 50 measurement functions, such as FFTs and X/Y display, import and Ohm termination. export utilities as well as support for all acquisition modes including data streaming. Data streaming allows the cards to continuously ac- Software selectable lowpass filter quire data and transfer it directly to the PC RAM or hard disk. Each analog channel contains a software selectable low-pass filter SBench 6 has been optimized to handle data files of several to limit the input bandwidth. Reducing the analog input bandwidth GBytes. SBench 6 runs under Windows as well as Linux (KDE, results in a lower total noise and can be useful especially with low GNOME and Unity) operating systems. A test version of SBench 6 voltage input signals. can be downloaded directly over the internet and can run the pro- fessional version in a simulation mode without any hardware in- Automatic on-board calibration stalled. Existing customers can also request a demo license for the professional version from Spectrum. More details on SBench 6 can Every channel of each card is calibrated in the factory before the be found in the SBench 6 data sheet. board is shipped. However, to compensate for environmental vari- ations like PC power supply, temperature and aging the software driver includes routines for automatic offset and gain calibration. Third-party products This calibration is performed on all input ranges of the "Buffered" Spectrum supports the most popular third-party software products path and uses a high precision onboard calibration reference. such as LabVIEW, MATLAB or LabWindows/CVI. All drivers come with detailed documentation and working examples are included in Digital inputs the delivery. Support for other software packages, like VEE or Da- This option acquires additional syn- syLab, can also be provided on request. chronous digital channels phase- stable with the analog data. 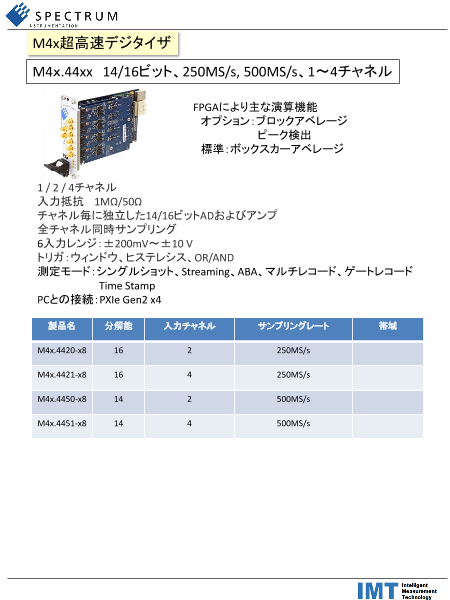 As de- Hardware features and options fault a maximum of 3 additional digital inputs are available on the front plate of the card using the PXI Express x4 multi-purpose I/O lines. The M4x series PXI Express cards use a PCI Express x4 Gen 2 connection. They can be used in every PXI Ring buffer mode Express (PXIe) slot, as well as in any PXI hybrid slot The ring buffer mode is the with Gen 1, Gen 2 or Gen 3. The maximum sustained standard mode of all oscillo- data transfer rate is more than 1.7 GByte/s (read di- scope instruments. Digitized rection) or 1.4 GByte/s (write direction) per slot. data is continuously written into a ring memory until a trigger event is detected. After the trigger, post-trigger samples are recorded and pre-trigger samples can also be stored. The number of pre-trigger samples available simply equals the total ring mem- ory size minus the number of post trigger samples. FIFO mode Timestamp The FIFO or streaming mode is designed for continuous data trans- The timestamp function fer between the digitizer card and the PC memory. When mounted writes the time positions of in a PXI Express x4 Gen 2 capable PXIe slot, read streaming speeds the trigger events in an extra of up to 1.7 GByte/s are possible. The control of the data stream is memory. The timestamps are done automatically by the driver on interrupt request basis. The relative to the start of record- complete installed onboard memory is used to buffer the data, mak- ing, a defined zero time, ex- ing the continuous streaming process extremely reliable. ternally synchronized to a radio clock, an IRIG-B a GPS receiver. Using the external synchronization gives a precise time relation for Channel trigger acquisitions of systems on different locations. The digitizers offer a wide variety of trigger modes. These include a standard triggering mode based on a signals level and slope, like Boxcar Average (high-resolution) mode that found in most oscilloscopes. It is also possible to define a win- The Boxcar average or high- dow mode, with two trigger levels, that enables triggering when resolution mode is a form of signals enter or exit the window. Each input has its own trigger cir- averaging. The ADC over- cuit which can be used to setup conditional triggers based on logi- samples the signal and aver- cal AND/OR patterns. All trigger modes can be combined with a ages neighboring points re-arming mode for accurate trigger recognition even on noisy sig- together. This mode uses a nals. real-time boxcar averaging algorthm that helps reducing External trigger input random noise. It also can All boards can be triggered using up to two external analog or dig- yield a higher number of bits of resolution depening on the signal ital signals. One external trigger input has two analog comparators acquired. The averaging factor can be set in the region of 2 to 256. that can define an edge or window trigger, a hysteresis trigger or Averaged samples are stored as 32 bit values and can be pro- a rearm trigger. The other input has one comparator that can be cessed by any software. The trigger detection is still running with used for standard edge and level triggers. full sampling speed allowing a very precise relation between ac- quired signal and the trigger. Multiple Recording 8bit Sample reduction (low-resolution) mode The Multiple Recording mode allows the recording of The cards and digitizerNETBOXes of the 44xx series allow to op- several trigger events with an tionally reduce the resolution of the A/D samples from their native extremely short re-arming 14 bit or 16 bit down to 8bit resolution, such that each sample will time. The hardware doesn’t only occupy one byte in memory instead of the standard two bytes need to be restarted in be- required. This does not only enhance the size of the on-board mem- tween. The on-board memory is divided in several segments of the ory from 2 GSamples to effectively 4 Gsamples, but also reduces same size. Each of them is filled with data if a trigger event occurs. the required bandwidth over the PCIe bus and also to the storage Pre- and posttrigger of the segments can be programmed. The num- devices, such as SSD or HDD. ber of acquired segments is only limited by the used memory and is unlimited when using FIFO mode. Firmware Option Block Average The Block Average Module im- Gated Sampling proves the fidelity of noisy re- The Gated Sampling mode petitive signals. Multiple allows data recording con- repetitive acquisitions with trolled by an external gate very small dead-time are accu- signal. Data is only record- mulated and averaged. Ran- ed if the gate signal has a dom noise is reduced by the programmed level. In addi- averaging process improving tion a pre-area before start the visibility of the repetitive signal. The complete averaging pro- of the gate signal as well as a post area after end of the gate signal cess is done inside the FPGA of the digitizer generating no CPU can be acquired. The number of gate segments is only limited by load at all. The amount of data is greatly decreased as well as the the used memory and is unlimited when using FIFO mode. needed transfer bandwidth is heavily reduced. Please see separate data sheet for details on the firmware option. ABA mode The ABA mode com- Firmware Option Block Statistics (Peak Detect) bines slow continuous data recording with fast The Block Statistics and Peak acquisition on trigger Detect Module implements a events. The ABA mode widely used data analysis and works like a slow data reduction technology in hard- logger combined with a ware. Each block is scanned fast digitizer. The exact for minimum and maximum position of the trigger events is stored as timestamps in an extra peak and a summary includ- memory. ing minimum, maximum, aver- age, timestamps and position information is stored in memory. The complete averaging process is done inside the FPGA of the digitiz- er generating no CPU load at all. The amount of data is greatly de- creased as well as the needed transfer bandwidth is heavily reduced. Please see separate data sheet for details on the firmware option. External clock input and output Using a dedicated connector a sampling clock can be fed in from an external system. Additionally it’s also possible to output the in- ternally used sampling clock on a separate connector to synchro- nize external equipment to this clock. Reference clock The option to use a precise external reference clock (normally 10 MHz) is nec- essary to synchronize the instrument for high-quality measurements with external equipment (like a signal source). It’s also possible to enhance the quality of the sampling clock in this way. The driver automatically generates the requested sampling clock from the fed in reference clock. PXIe bus The PXI Express bus (PCI Express eXtension for instrumentation) of- fers a variety of additional normed possibilities for synchronising different components in one system. It is posible to connect several Spectrum cards with each other as well as to connect a Spectrum card with cards of other manufacturers. PXI reference clock The card is able to use the 100 MHz low-jitter reference clock that is supplied by the PXIe system. Enabled by software the PXIe refer- ence clock is fed into the on-board PLL. This feature allows the cards to run with a fixed phase relation. PXI trigger The Spectrum cards support star trigger as well as the PXI trigger bus. Using a simple software commend one or more trigger lines can be used as trigger source. This feature allows the easy setup of OR connected triggers from different cards. External Amplifiers For the acquisition of extreme- ly small voltage levels with a high bandwidth a series of ex- ternal amplifiers is available. Each of the one channel am- plifiers is working with a fixed input impedance and allows - depending on the bandwidth - to select different amplifica- tion levels between x10 (20 dB) up to x1000 (60 dB). Us- ing the external amplifiers of the SPA series voltage levels in the uV and mV area can be acquired. Export Versions Special export versions of the products are available that do not fall under export control. Products fall under export control if their spec- ification exceeds certain sampling rates at a given A/D resolution and if the product is shipped into a country where no general ex- port authorization is in place. The export versions of the products have a sampling rate limitation matching the export control list. An upgrade to the faster version is not possible. The sampling rate limitation is in place for both inter- nal and external clock.